Number #1 Sorsogon City Target listed held for possession of five plastic sachets of crystal meth. 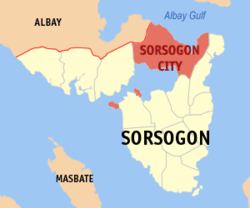 Sorsogon City, [02.02.19] – A 50 years old was arrested by authorities in an anti-illegal drugs operation this morning at Gate 3, Barangay Bibingchan, Sorsogon City, a police report said. According to Police Superintendent Jefferson B. Araojo, Officer-in-Charge, Chief of Police of Sorsogon City Police Station the buy-bust operation was conducted at 8:20 o’ clock in the morning today, at the suspect’ residence. Two plastic sachets containing white crystalline substance suspected to be methamphetamine hydrochloride was seized during the actual buy-bust, while three more plastic sachets were seized during the frisking done by the police operatives. The suspect Orlando Dollesin Dichoso, 50 years old was arrested after the operation for violation of Republic Act 9165 by the elements of Sorsogon City Police Station, Police Regional Office – 5 Regional Intelligence Division, Police Intelligence Branch, Sorsogon Police Provincial Office and PDEA – Sorsogon. Dichoso is the Number #1 City Drug Target Listed person.